"When you have to make a choice and don't make it, that in itself is a choice." William James. Procrastination. It’s something we all do and probably a lot more than we care to admit. But why? Why do we procrastinate? In psychology, procrastination refers to the act of replacing high-priority actions with tasks of lower priority, or doing something from which one derives enjoyment, and thus putting off important tasks to a later time…..
As you can see both sources define procrastination in terms of completing tasks. I think we can agree that when it comes to completing some tasks it is easy to understand why we would procrastinate. It is simply not something we want to do at the time, so we do something else. We postpone doing the task. For more on completing tasks see Are you a Fumbler or a Finisher? But in addition to procrastinating in doing tasks, which are really at the micro level in terms of our life, I believe we have other issues or things that we procrastinate in addressing or doing at the macro level. These are macro issues floating underneath the conscious micro level. Far from tasks to be completed these are very different. These are the nagging feelings that make you question the direction your life has taken or some other aspect of your life that no longer works for you. These feelings bring up scenarios that, if you acted on them, could lead you in a different direction or require you to make some serious adjustments or changes to your life. Although you know deep inside that you need to make them, it is too scary. Some of the changes could be drastic and threatening. So it is no wonder we also find ways to avoid addressing these issues. But by not addressing them or taking action, over time they seem to speak a little louder and they become a little more insistent. And this begins to weigh you down. You feel as if a dark cloud has come over you. It begins to make it harder to address your conscious “tasks”. First of all, I don’t think you need to blow up your current life. It is simply not necessary to clear the decks and start fresh. Most of what you currently have in your life is probably good and you want it. 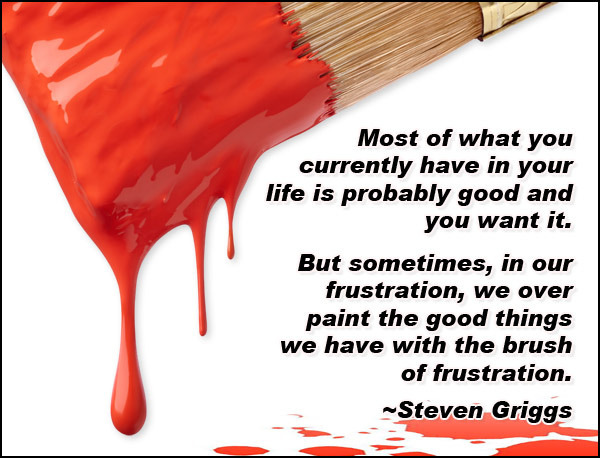 But sometimes, in our frustration, we over paint the good things we have with the brush of frustration. We almost throw the baby out with the bath water so to speak. But upon a closer, calmer look, you will see that most of the things you have in your life are desirable and you do want them. You don’t need to get rid of everything. A better choice would be to look at the changes you think you need to make and ask yourself “What part of this could I do now?” "What little steps could I take to move towards these needed changes?" “Are there areas that I could modify or adjust?" Then begin to make the small changes you've chosen and move towards your desired self. I understand frustration and urgency. I also have a tendency to go over the top. I see something I think I need or a change I think I should make and I go for it. Full bore. This has its advantages and disadvantages and I have made many right or left turns in my life that probably weren’t necessary……. but then again it’s a journey not a destination. So it’s not necessary to move too fast or to make big changes. Better to start smaller. Look at what you are concerned about or thinking about on a subtle level, try to synthesize what the main issue or overriding thought is. Look at that area that you feel frustrated about. Then look at it in terms of steps. What would be the first step you could make to affect the changes you want? Take that 1st little step and then check in to see how you feel. If it feels right and you feel better, take the next step. Keeping going. Your feelings will change and the changes you are making will expand and you will begin to see yourself moving faster towards that new you.